BUT WE HAVEN’T FORGOTTEN THEM. 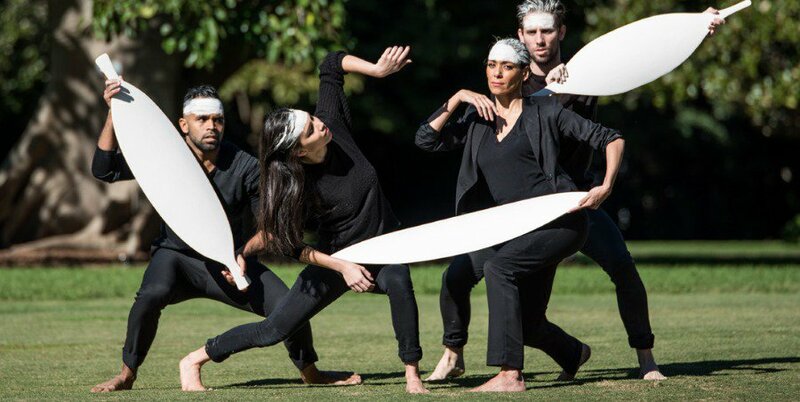 Bangarra Dance Theatre for Kaldor Public Art Projects, photographer, Mark Stanley. On Monday the 22nd of September The Royal Botanic Gardens in Sydney’s CBD will be transformed into a spectacle of 15,000 bleached, gypsum plaster reinstated shields, organised on the ground. They will wrap the trees, extending beyond the physical layout of the gardens into the metaphoric space of the Garden Palace. The Garden Palace; an architectural masterpiece by James Barnet, big enough to fit six of the QVB within it, was created to exhibit ”Australia’s blooming trade”. This dominating building was created in 1879 before it burnt to the ground three years later in 1882. No one knows why the building burnt down, yet Jonathan Jones, a Wiradjuri and Kamilaroi artist based in Sydney, is demanding we think about the horrendous tragedy. Jones was the winner of the 32nd Kaldor Public Art Projects, in which artists were offered the opportunity to transform a part of Sydney with their “Very Good Idea.” Jones’s idea was one to which the audience are invited to examine the barrangal dyara, the skin and bones, of the Garden Palace. Whilst the Palace hosted trade exhibitions, it also became the prison for the largest collection of Indigenous artefacts. Items that they claimed to be from warfare were burnt to the ground, leaving a massive hole for many Indigenous Australians. Jonathan discovered the missing gaps trying to find his own family’s history and realised the huge scale of loss from the south-east communities of Australia. Alongside the ‘warfare’ that was shown in the ethnological collections, the objects used by women and children were trapped in the basement. Hidden from the public to promote the imperial terra nullius, ‘nobody’s land’. Jonathan Jones draws upon the loss and pain of his physical connection to Country, hoping with this project no one else has to suffer the pain he felt 20 years ago. From this loss Jones is demanding we pay attention to what happened in the Garden Palace by activating the space occupied by the shields with soundscapes from eight different language groups ranging from the Murray River up to Queensland. The gardens become a collaboration of sculpture and sounds from Sydney Language, Gamilaraay (Northern NSW), Gumbaynggirr (Along the Pacific coast, from the Nambucca River in the South to around the Clarence River in the North and the Great Dividing Range in the West), Gunditjmara (Western Victoria), Ngarrindjeri (lower Murray River, western Fleurieu Peninsula, and the Coorong of southern, central Australia), Paakantji (Mildura across the Victorian border to Queensland), Wiradjuri (central NSW) and Woiwurrung (central Victoria). Through these sound activated spaces, Jones wants the audience to engage with the stories of the land, taking language out of the classroom and into everyday life in order to connect with Country. Jones has also created a native meadow of kangaroo grass, at the heart of where the Garden Palace’s dome once stood beaming out to the harbour heads. As you enter the grassland, a disruption to the formal elements of the garden, you can hear the Wiradjuri language of Uncle Stan Grant. He invites us “to remember.” This echoes again though the children's voices as they learn “to remember the knife” and then the teacher reminds them “to remember the knife’s edge”. The palace amplified the lies that were and continue to be told surrounding the importance of Country. Yet, the tall grass with its sculptural flower heads absorbs the audience into the history, questioning these narratives that the colonial powers had dominated for hundreds of years. Jones has worked extensively with Uncle Bruce Pascoe to understand the hidden truths of Aboriginal agriculture. Truths denied to us to prevent questions like: “Why we Australians allowed sheep to mow it down?” Jonathan Jones will not let you hide from the truth today. Wesley Enoch describes how the land has it’s own power. Perhaps the land underneath the Garden Palace was so scarred from the defoliation from the settlers it caused it’s own tragedy. Today the community are coming together to remember the loss, but as Uncle Stan Grant senior says about the language coming back onto people’s tongues: “it’s woken up now, and it’s going like wildfire, spreading everywhere.” The culture identities are echoes through the earth, and Jonathan Jones’s Project in the Botanic Gardens of Sydney allow us all to explore these truths. The great fire of 1882 caused so much devastation yet as an element of Country it helped cleanse the land, removing the imperial vision of the Garden Palace and brings us to barrangal dyara to let us reveal the layers. Jonathan Jones and Kaldor Public Art Projects have worked together to build action in Sydney and Australia. Whilst the view of terra nullius is no longer accepted, stereotypes still exist. Racism is accepted as Australia’s dirty little secret. Barrangal dyara is bringing change, the poor treatment of Aboriginals should no longer be accepted, the language groups should be taught in every school bringing non aboriginal children into the culture of Country they live on. This is sacred land and the sounds have meanings beyond what we can comprehend, instead, they exist as a place in which we lend ourselves to Country. Jones reflects on the change already happening in the two years that the project has been in development: Uncle Stan Grant has been awarded an honorary PhD and has featured in the New York times for his revival of language and Uncle Bruce Pascoe has been given the NSW Premier’s Book of the Year literary award for Dark Emu, his book investing the truths around Aboriginal agriculture. Barrangal dyara is formed together as part of the communities who suffered the loss, the Gadigal Elders Uncle Charles (Chicka) Madden and Uncle Alan Madden have worked with Jonathan Jones and the Sydney Language to welcome the project into Sydney. You are invited to witness this amazing moment in history and most importantly to witness this project is not just about loss, but reawakening the language nationally and inspiring social change for every community.